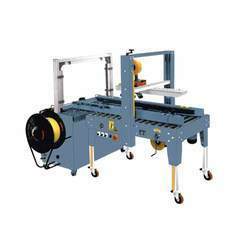 Our product range includes a wide range of fully automatic online tapping with strapping system, automatic sealing strapping machine, auto tapping with strapping system and automatic packing line box strapping machine. Facilitated by technically advanced process, we are trading and supplying a precision engineered collection of Automatic Sealing Machine that is widely used for sealing pouches. With the support of knowledgeable professionals, the offered machine is manufactured from the finest grade components and developed technology in adherence with set industry norms at our vendor’s end. Available in various models and technical specifications, our provided machine is tested against numerous quality parameters by our quality inspectors. 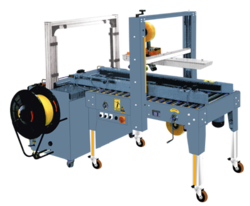 This system combines auto carton sealing machine with fully-auto strapping machine to meet the customer’s needs and reduce labour costs. Design of combining these two machines together makes the job done in one process. The Aluminium Arch is specified for small cartons. The strapper can precise the strapping at the requested position.